The organisation is based down at Lasham but are able to cover most of the UK. They also have a base at Tatenhill near Stoke. The BDFA have a small fleet of aircraft. There’s a Bulldog, donated by the King of Jordan and a couple of PA28s. These particular aircraft have been chosen for accessibility reasons. 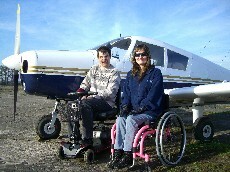 With the assistance of a hoist, disabled pilots can be helped into the seats. The PA28, via the wing, and directly in, via the large canopy, to the Bulldog. 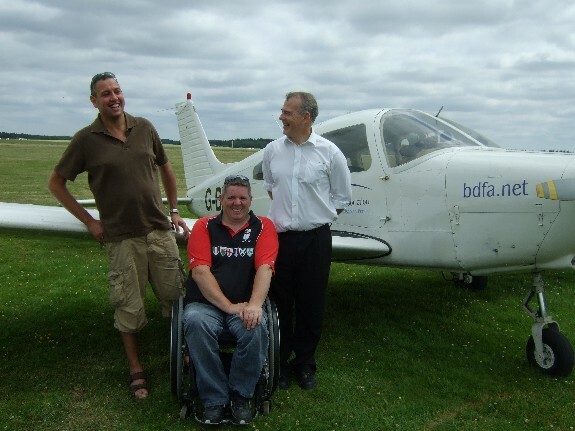 In the past, the BDFA have also offered flights in gliders, microlights and hang gliders and they hope to offer these services again in the future. 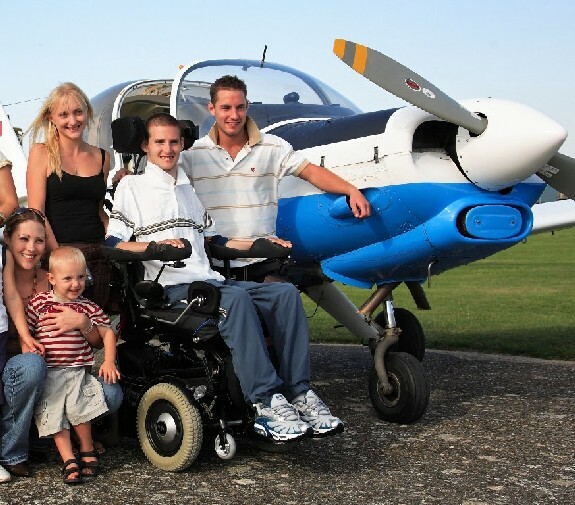 The British Disabled Flying Association offer the flights to those with learning disabilities, disabled children and those with mobility impairments. The aircraft have been modified with Visionair hand controls for the rudder and Mike says that the hand brake on the PA28 can be used instead of the footbrakes; something that I’d never even thought about. 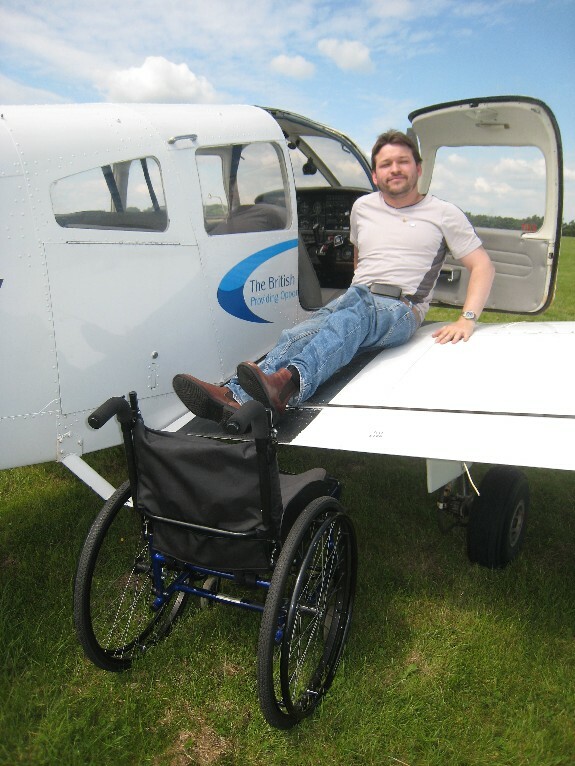 Mike says that The British Disabled Flying Association is not just about smiles on faces. A flying experience can give the potential pilot confidence to try other things and stimulus to achieve other goals. Able bodied pilots and members of the public can also participate. This could be by helping at flying days, piloting aircraft at flying days, fundraising and sponsorship. There are only a few members of full time staff at the BDFA so volunteers are more than welcome. – Charity Flying Network. This is a network of private pilots with PPLs who are willing to take disabled people flying or are just keen to help with BDFA activities. – Farnborough Airshow. The BDFA will be attending alongside their key sponsors and will be exhibiting their services to the general public. You simply pick the charites you wish to support and then do your usual on-line shopping. The charity then gets a small, or not so small, commission. – Extreme G for Free. Similar the ubiquitous ‘sponsored parachute jump’ you will soon be able to raise sponsorship and be able to take an aerobatic flight. Keep your eyes on the BDFA website for details. This entry was posted in All Podcast Episodes, Flight Training, Flying Professionals, GA Flying and tagged Charity, Disabled, Flight Training, Flying, General Aviation, Podcast, podcasts, PPL by admin. Bookmark the permalink.